I’m still in transit and will most likely be for another couple of days. Yesterday, I flew on my first C-17. It is amazing, much different from the C-13 that I fly “in country”. It’s cavernous and I felt guilty that we didn’t fill it. 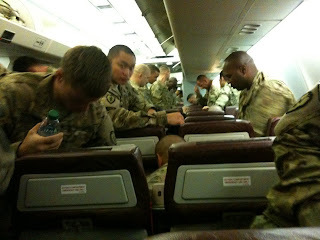 The C-13’s and helicopters I've flown “in country” have been packed with people and cargo. The last FOB I was at was a “transiting FOB” that all Troops have to go through, both coming and going. I interviewed the CO that heads up the medical team, Col. Bannister yesterday. She is an amazing woman who does her job well, professionally and passionately. I am now at a FOB “in country” where the Army enters. Last time I was at Leatherneck with the Marine Corp. These FOB'S are huge and where the factions go to be refreshed in combat training before being sent to their assignment. “Guns Up” with live rounds from here on in. It is easier to fly commercial as a civilian into a combat zone. Actually deploying with the Military brings a whole new light to mass travel. I wonder at moments is this so difficult because there are 225 of us traveling together or is it that the Army makes it difficult to wear us down so all you want to do is to get where you are going no matter what awaits you. The hurry up and wait attitude along with the endless lines exhausts you to the point of mindlessness. I who cannot sleep on an airplane slept most of the 20 plus hours of flying time. At one point I wondered if our food was drugged or sleeping gas was being pumped in over us to calm our fears and sleep away the journey like astronauts flying to Mars. During the times when the plane was being refueled there were moments of sullenness. I looked at young soldiers faces and wanted to confront their fears. After all I was okay, I had been on the ground, seen it and now I was going back for more. But I didn’t. I let them wallow, hoping it will be better for them to go through their feelings and experience it all, the good, the ugly and the horrific.